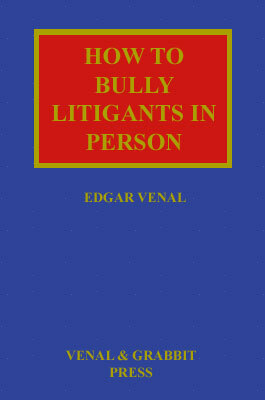 How to Bully Litigants in Person will soon be available at all good legal booksellers, at the very reasonable price of £499.99. One thing happened to me with a Barrister, just before going into Judge, he said, "Mr David, your ex wife has brought this post for you that went to the FMH, here you go!" Then when I went out to reach out for the letters he snatched them back and went "Nahhhh, ner ner na ner na!" Seriously! That happened. That's what they are paid so much for. I shall pass your excellent suggestions to Mr Venal, in case he wishes to include them in the second edition. Also includes advice on how to ignore your conscious, enjoy the suffering of those less fortunate and pander to the right. Are we talking about Tony Blair now?